This post looks at three cities meeting the target of zero traffic fatalities. City population density, culture and location don’t appear to be factors. The use of public transport does have an influence. Alexandria, VA, in the US, has a population equal to Hamilton’s, twice the population density, and a road network that to me looks auto-centric (looking at Google images). According to one reference, 68% of commuters travel by car to work, (Wellington 64%), 5% walk or bike (Hamilton 13%) and about 22% of people travel by public transport (Wellington 7%). One reference: Alexandria transportation Master Plan page16. NZ city mode share data page 21. Alexandria Vision Zero. One death in 2015, zero in 2014, and two in 2013. 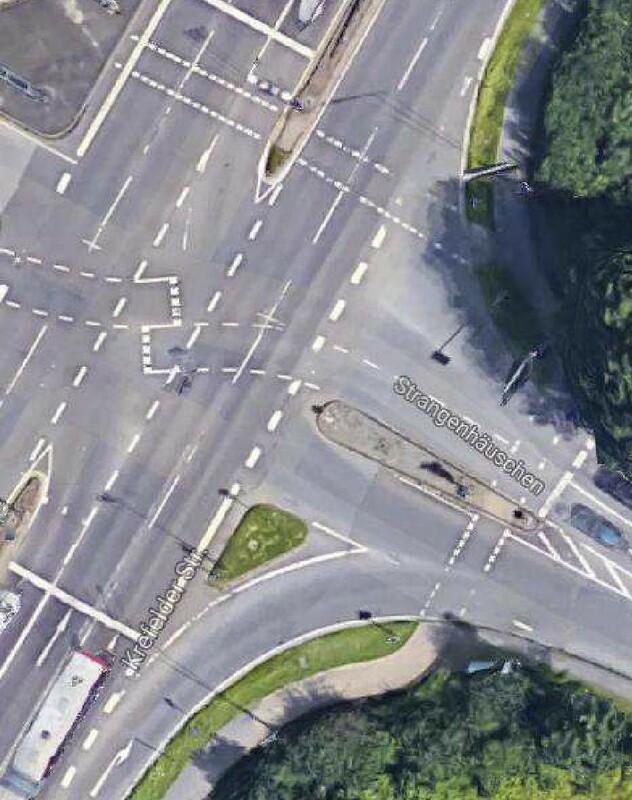 The above image is of a Dutch-style intersection in Aachen, with a single crossing for pedestrians/cyclists, so there is no need cross a slip lane to an island before crossing more traffic lanes. The location in Aachen is Strangenhauschen / Krefelder Str. Aachen, in Germany, has a population density equal to Hamilton, with a total population of 245,900. This city doesn’t appear to have a strong bias toward any single type of transport. Travel modes include 11% Bike, 15% Public Transport (this has been lower; see the graph below), 22% walk (Wellington 27%), 52% car, and using another measure, 6% of Aacheners are “multimodal”: within a week they use bus/train, car and bike. What sets Aachen apart is that 31% of the households have no car. In Hamilton overall, 8% have no car, while for Hamilton central this is 24.5% and in Insoll area 21% of households don’t have a car. Like many Western cities, cars started to flood its streets during the second half of the 20th century. By the end of the 1990s, about 52,000 vehicles circulated in the city center every day. Today, from the mayor’s office at City Hall, he can hear people talking outside instead of engines and horns. “It’s amazing,” mayor Lores says. “14,000 cars used to pass through this street every day”. Now, according to the city administration’s analyses, motor traffic in Pontevedra’s historical centre has been reduced by an unbelievable 97 percent since 1999. Compare this to Anglesea St, which had 13,976 cars per day in 2002, and is now at 11,766, which is a 16 percent fall. Clearly Hamilton is a slow follower. But it’s not just the streets near City Hall that have been transformed in Pontevedra. Thanks to the elevated pedestrian crossings, and citywide speed limit of 30 km/h, the city hasn’t suffered a single traffic fatality since 2011. Hamilton’s walking/biking mode share out-performs Alexandria , VA, but the state-wide focus of Vision Zero allows it to place safety above other benefits in society. 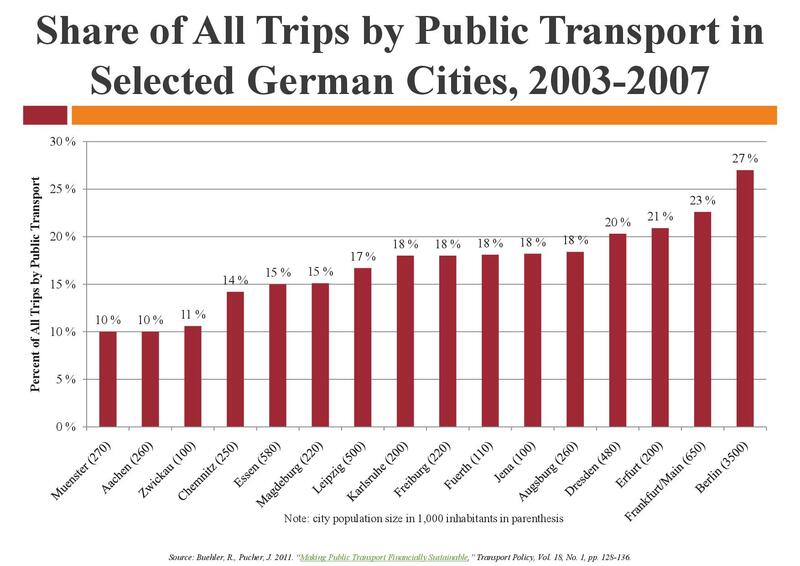 For Aachen, the multimodal approach even though it is currently only 6%, has allowed people to see transport less as movement of vehicles and more as movement of people.